When we talk about chiropractic care, it’s important to understand that the nervous system and spine are integral to your long-term health. The spine should move in a certain way and continuously during the day. As humans, we sit too much and don’t move enough. It starts to affect the function of the spine and can impair brain function. And since the brain is the master system of the body it can begin to have a negative effect on those areas. Though chiropractic is known for helping with back pain it doesn’t treat any syndrome or condition. It just allows the body to heal itself by putting the system back in better alignment so it can start working more efficiently. 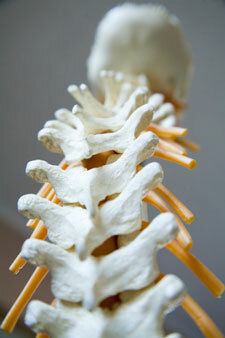 Chiropractic does have great success with common conditions such as back pain and neck pain. Along with transforming your lifestyle and changing nutrition & exercise, it can have incredible effects on your overall health over time. One variable is time. With time, the body has an amazing ability to heal if you do the right things. Regarding treatment at the clinics, we all work with different techniques; all of them have the same goal of getting the system functioning optimally. We give nutrition advice and recommend certain supplements. Additionally, we use a masseur and spinal rehab therapist (only in the Stockport clinic). Our goal is to help patients start improving functionally and sticking to a programme of care. It’s always up to the patient whether they just want pain relief or want to improve more functionally. Activator®: This noninvasive and specific technique uses an implement which puts impulses into the spine. Active Release® Technique (ART): This is a muscle technique, which is a very specific soft tissue therapy for more chronic soft tissue injuries. MC2: Similar to torque release, this is a low-input tonal technique. Thompson Drop: Using a spring-loaded bench, this hands-on dropping technique is used to get the body in a better position. Diversified: With this standard hands-on adjustment technique you will hear an audible release where the bone moves a little bit. If you’ve never been to a chiropractor before and are nervous about what to expect, we want to reassure you a tender approach will be taken. We can use the Activator® instrument, which is gentle. Our care is should not be painful. If, however, you are achy or sore afterwards we recommend using an ice pack in case there’s inflammation in that area that we’re treating. You’re generally not going to have any repercussions from treatment. Get on the path to feeling great with natural chiropractic care. Book an appointment today!